Renaissance Woman: Postcards #45 - S.N. Leek and Elk! Postcards #45 - S.N. Leek and Elk! 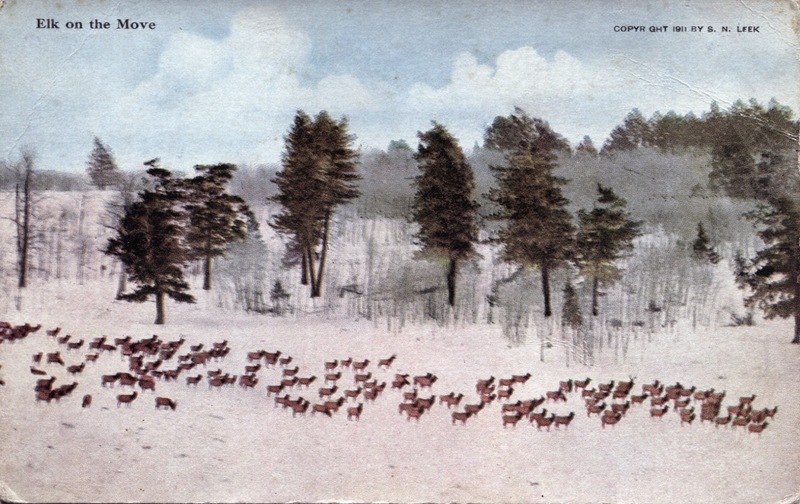 The postcard is (obviously) of a herd of elk. And I assumed it was a herd of Elk from Atlin, because, well, that's where my head was. But when you are doing history, you have to be a little more on the ball than that. If you take a look, printed on the front of the card is: "COPYRIGHT 1911 BY S. N. LEEK," and on the back is printed: "Copyright 1911 by S. N. Leek, Jackson, Wyo." 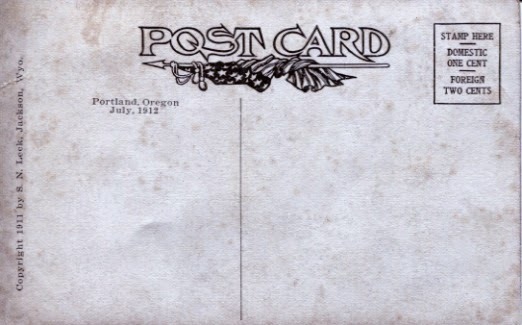 as well as: "Portland, Oregon July, 1912." Now, just because it is copyrighted by someone in Wyoming and has Oregon printed on the back does not mean that it wasn't bought in Atlin - and it may well have been - but I doubt it. When I looked into S. N. Leek, I expected to find little if no information on a photographer over 100 years ago - the kind of stuff I normally find. But this time I got a surprise. S. N. Leek homesteaded in South Park, Wyoming, in 1891. At that time there were around 30,000 elk in the region - no longer migrating through the area because of human development, the herd stayed in the region for the winters. Leek became a hunting guide with one of his clients being George Eastman (of Eastman Kodak fame) who gave him a camera. Three harsh winters put the herd in danger from 1909-1911 when numbers decreased to less than 10,000. Local residents started to feed the Elk hay as they were dying in such numbers. Leek took pictures of the problem, publishing them in magazine and newspaper articles and giving lectures around the country - leading to the establishment of the Elk Refuge. If you take a look at his book found at this link, you'll see the photo that is also this postcard along with many other photos of elk and hunters and such. Anyhow, why is this postcard in this collection?? Well, I don't know. Maybe someone went to Wyoming. The fact that Portland, Oregon is printed on the back makes me think that someone went to Oregon - which is probably more like it since family members do live in Oregon - and they've been there since 1908. The fact that 1912 is printed on the back makes me think that perhaps Nellie and Jack headed to Oregon when they got married - or perhaps the summer after. Why they would have bought a postcard of Elk, I don't know - unless perhaps it was part of a fundraiser for the Elk Refuge. 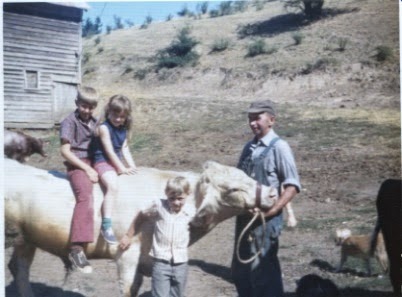 When I was a kid, several times we went down to Yamhill Oregon to visit Uncle George and Aunty Gladys - two unmarried children of Uncle Alec - an incredibly old, deaf man who scared me (he died in 1973 at the age of 89 when I was 4, so when I knew him I was really little and not used to the elderly - and, well, he was grouchy!). Alec had come to Oregon from Scotland and was one of my Great-Grandmother's brothers. He and his wife, Helen (ore Ellen or Nella - depending on which census you are looking at - I bet she had a thick accent and the recorders couldn't understand her) had 7 children, I believe. Funny where one old, unused postcard can lead - from Atlin to Wyoming to bull riding in Oregon.